Industrial pioneers Skinny Puppy have announced they'll be firing off their most recent Weapon again on an upcoming, electronic-geared package tour called "The Alliance of Sound." 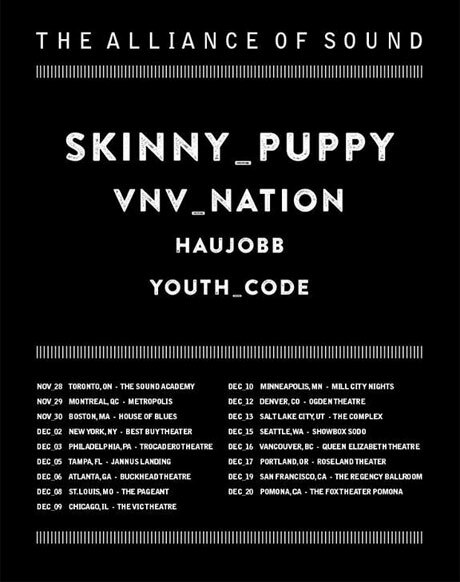 Skinny Puppy will steer the four-band bill around North America from the end of November through to late December. Joining the veteran unit will be dark wavers VNV Nation , German electro-industrial unit Haujobb and L.A. EBM ghouls Youth Code. The package tour kicks off November 28 at Toronto's Sound Academy, with additional Canadian dates set to take place in Montreal and Vancouver before the trip winds down in California. You'll find the complete show schedule down below.